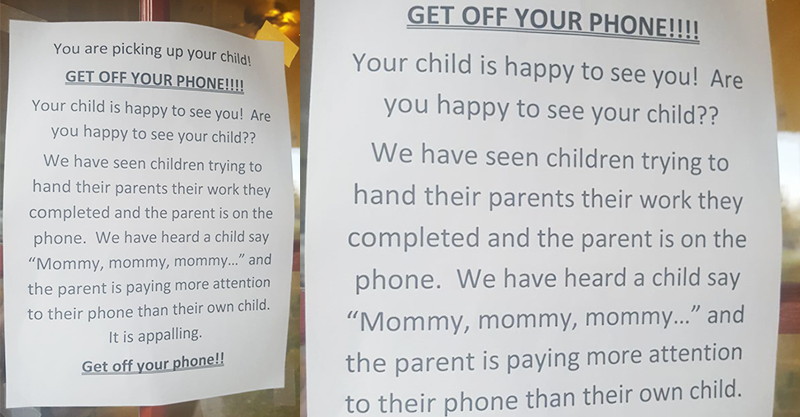 A Texas daycare centre has posted a note urging parents to put their phones down when they are picking up or dropping off their kids, and it’s sparked wild applause… and a hefty dose of outrage. Houston mum, Juliana Farris Mazurkewicz, snapped a photo of the note asking parents to put down their phones when they’re in the centre, and posted it to her Facebook profile. It’s since been shared a staggering 1.4+ million times! Julia shared the image after she’d picked up her kiddos from their daycare a couple of Fridays ago, interested to see what her Facebook friends and family’s response might be. “I thought it was awesome. I thought it was funny and it definitely made me (think),” Juliana told Fox News. Little did she know her post would go much, much further than her Facebook inner circle. You are picking up your child! GET OFF YOUR PHONE!!!! Your child is happy to see you! Are you not happy to see your child?? We have seen children trying to hand their parents their work they completed and the parent is on the phone. We have heard a child say ‘Mommy, mommy, mommy…” and the parent is paying more attention to their phone than their own child. It is appalling. Get off your phone!! The reaction to the daycare centre’s rather feisty no-phones directive has been passionate and varied. “Regardless of whether or not you agree with the sentiment, this note heaps guilt and shame on every parent that walks through the gate and is a completely gutless, inappropriate way of dealing with the issue,” one commenter posted. “Really? Only mommys are guilty? Come on!” another pointed out. “I see this all the time in parks, on walks, everywhere kids are, saying “mommy look at me, mommy PAY ATTENTION to me!! !” They will be grown before you know it, and you will have plenty of time with your phone,” one woman wrote. With phone addiction becoming a growing problem, our gut feeling is that this daycare provider is simply advocating in the best way they know for our kids. Surely they’re doing us a favour by reminding us of what’s truly important, even if it is in a pretty shouty way. The days are long, but the years are short, guys. What do you think? Is this fair enough? Or has the daycare centre overstepped? Let us know on the Babyology Facebook page.